Lovely soft and sweet nougat speckled with peanuts and bursting with fruit flavour jelly pieces. 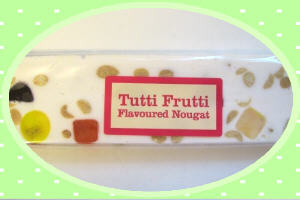 TUTTI FRUITTI NOUGAT ingredients: sugar, glucose srup, peanuts, modified maize starch, egg albumen, lactic acid, flavourings & colourings anthocyanin, capsanthin, curcumin, vegetable concentrates (nettle, spinach). May contains peanuts, egg and sulphites. May contain traces of other nuts, soya and milk.